In the 1930’s the Danish were researching the indigenous population of Greenland. The researchers discovered the local population had a uniquely low level of heart disease. Further studies linked the vitality of the people to their diet which included large amounts of fatty fish and seal meat. The Omega-3 fatty acids (EPA, DHA and DPA) acted as a natural, long term solution to prevent heart disease. That said, there is a lot of debate on the effectiveness of Seal Oil over Fish Oil as a natural source for Omega-3 fatty acids. Proponents of Seal Oil point to the fact seals, like humans are mammals and feel there is a closer, more natural connection with the oil produced by a similar species. They also point to studies showing Seal Oil can contain up to 30% more Eicosapentaenoic Acid (EPA) than fish oil. Harp Seals are marine mammals found abundantly in the ice-cold waters off Newfoundland and Labrador. Because of this environment, harp seals have unique biological characteristics, and is an excellent source of Omega-3 fatty acids. Thousands of studies show the benefits of Omega-3 fatty acids for the heart and circulatory system. 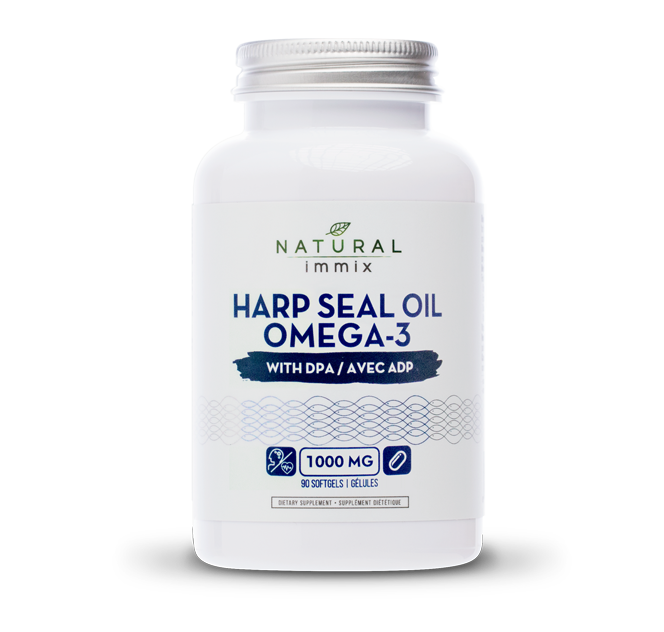 Three important Omega-3 fatty acids are DocosapentaenoicAcid (DPA), EicosapentanoicAcid (EPA), and DocosahexanoicAcid (DHA), all found liberally in harp seal oil. These fatty acids help reduce low density lipoproteins (LDLs) and raise levels of good high density lipoproteins (HDLs). These nutrients also reduce blood vessel constriction, lower fibrinogen, (the blood clotting factor), and keep platelets from becoming too sticky. Seal oil contains all three components of Omega-3; EPA, DPA and DHA and is beneficial for the maintenance of good health. • 100 % pure Harp Seal Oil. • Contains all three components of Omega-3 in the same proportions  that are found naturally in the human body. • Resistant to natural oxidative processes. • Virtually free of cholesterol. • Omega-3 content of 20 %-25 % higher than fish oils. • Better absorbed than fish or seed oils. • Provides 30 mg of Docosapentaenoic Acid (DPA). • Provides 60 mg of Eicosapentaenoic Acid (EPA). • Provides 60 mg Docosahexaenoic Acid (DHA). • Standardized formulation guarantees a consistent amount of active ingredients in each dose.